Zogoflex Air Dash frisbee for dogs has an aerodynamic design making it easy for humans to throw and fun for dogs to fetch. Its center hole allows for smooth, off the ground pickups, a stable, fast flight and a gradual descent. Made from West Paw Design’s extremely pliable, one-of-a-kind proprietary material called Zogoflex with air infused into the material to make this toy lighter. 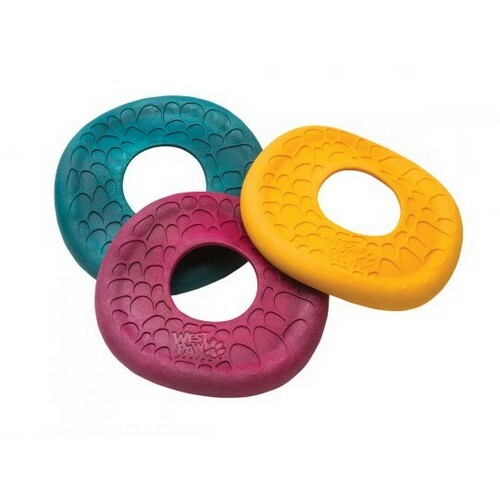 The Zogoflex Air Dash is recyclable, floatable, guaranteed against dog damage, BPA and phthalate-free, Latex free, non-toxic and dishwasher safe.